Castle Rock, Franktown, Elizabeth, Kiowa, Monument, Black Forest, Sedalia and Palmer Lake. 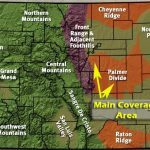 Areas of the Denver metro along C-470 from Chatfield to Interstate 25, and along E-470 from Interstate 25 to Smoky Hill Road are on the extreme northern fringe of the Palmer Divide. The elevation along the divide varies between about 6,000 and 7,887 feet (1,829 and 2,404 m), with the high point being Bald Mountain in southern Douglas County. This peak can be seen from I-25 just northeast of Monument Hill. 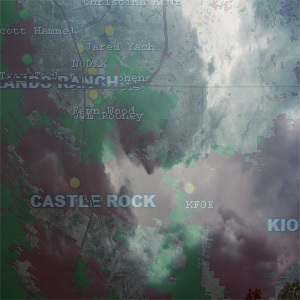 This uplifted area causes a slight increase in precipitation from the rest of eastern Colorado, resulting in the presence of the Black Forest, a peninsula of trees surrounded by dryer grassland plains. The Palmer Divide is also implicated in enhanced landspout and tornado activity to the east of Denver in the Denver convergence vorticity zone (DCVZ).